En Vogue Art Tiles, from Oregon. Handmade in the USA, ceramic art tiles add a pop of color to any space. Many designs and themes to suit all tastes! Flowers, birds, beach, cabin, coffee, wine, and more! 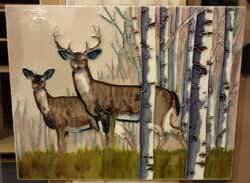 Deer Art Tile, by En Vogue. Measures 11 x 14 inches. Features artwork of a pair of deer walking through an aspen forest. Made in the USA. This beautiful artistic tile is hand-painted and high-temperature kiln-fired with brilliant colors, glass-like shiny glaze, and embossed relief-like texture. Can be hung on a wall or placed on an easel, indoor or outdoor. Can also be used as a hot plate. Backing can be removed by soaking and water, then installed like a regular tile. Wide variety of images available! Lighthouse by the Beach Art Tile, by En Vogue. Measures 6 x 16 inches. Made in the USA. This beautiful artistic tile is hand-painted and high-temperature kiln-fired with brilliant colors, glass-like shiny glaze, and embossed relief-like texture. Can be hung on a wall or placed on an easel, indoor or outdoor. Can also be used as a hot plate. Backing can be removed by soaking and water, then installed like a regular tile. Wide variety of images available! 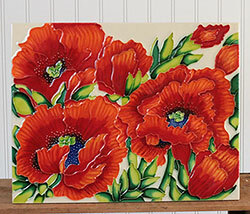 Red Poppies Art Tile, by En Vogue. Measures 11 x 14 inches. Made in the USA. This beautiful artistic tile is hand-painted and high-temperature kiln-fired with brilliant colors, glass-like shiny glaze, and embossed relief-like texture. Can be hung on a wall or placed on an easel, indoor or outdoor. Can also be used as a hot plate. Backing can be removed by soaking and water, then installed like a regular tile. Wide variety of images available! 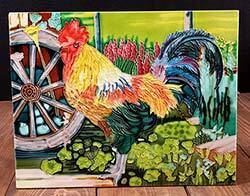 Rooster Art Tile, by En Vogue. Measures 11 x 14 inches. Made in the USA. This beautiful artistic tile is hand-painted and high-temperature kiln-fired with brilliant colors, glass-like shiny glaze, and embossed relief-like texture. Can be hung on a wall or placed on an easel, indoor or outdoor. Can also be used as a hot plate. Backing can be removed by soaking and water, then installed like a regular tile. Wide variety of images available! Rooster Vertical Art Tile, by En Vogue. Measures 6 x 16 inches. Made in the USA. This beautiful artistic tile is hand-painted and high-temperature kiln-fired with brilliant colors, glass-like shiny glaze, and embossed relief-like texture. Can be hung on a wall or placed on an easel, indoor or outdoor. Can also be used as a hot plate. Backing can be removed by soaking and water, then installed like a regular tile. Wide variety of images available! Seahorse Art Tile, by En Vogue. Measures 3 x 16 inches. Hangs vertically. Made in the USA. This beautiful artistic tile is hand-painted and high-temperature kiln-fired with brilliant colors, glass-like shiny glaze, and embossed relief-like texture. Can be hung on a wall or placed on an easel, indoor or outdoor. Can also be used as a hot plate. Backing can be removed by soaking and water, then installed like a regular tile. Wide variety of images available!